Samuel Shem’s The House of God is widely regarded as one of the most influential novels about medical education in the twentieth century. Decades after being published, this satire still raises issues of how interns and residents are trained and how patients experience their treatment. 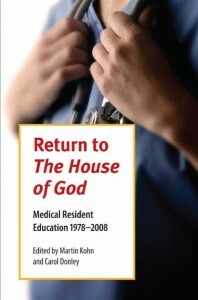 Return to The House of God is a scholarly and creative response to the best-selling novel, exploring its impact on medical education, residency training, and the field of literature and medicine. Among the contributors are some of the foremost scholars in medical humanities and the most highly respected physician- and nurse-writers. This collection responds to the surprises, challenges, and wit of The House of God. Some contributors point out constructive changes that the novel stimulated, while others see today’s medical residency experiences as still in need of a cure. Some contributors appreciate the novel’s black humor regarding overworked residents in hospitals, while others wince and deplore it. A few even take their cue from Shem and transform their experiences into literature. Final words of the volume come from Janet Surrey, Shem’s wife, and Stephen Bergman himself, aka Sam Shem, reflecting on thirty years of doctoring and writing. Teaching faculty in medical schools, residency programs, bioethics, and medical humanities, as well as Shem fans worldwide, will enjoy this important contribution to the study of literature and medicine. Martin Kohn is cofounder and senior associate for Program Development, Center for Literature, Medicine and Biomedical Humanities at Hiram College. He previously directed the Human Values in Medicine program at Northeastern Ohio Universities College of Medicine. His poetry has appeared in numerous print and electronic journals. Carol Donley is Andrews Professor of Biomedical Humanities and cofounder of the Center for Literature, Medicine and Biomedical Humanities at Hiram College. With Martin Kohn, she coedits the Literature and Medicine series at the Kent State University Press. Retired from full-time teaching, she continues to teach a few courses in the Biomedical Humanities program at Hiram.